The Bourse ended the week on a mixed note as the ASPI increased by 37.63 points (or +0.62%) to close at 6,117.89 points, while the S&P SL20 Index decreased by 23.39 points (or -0.38%) to close at 3,216.82 points. JKH was the highest contributor to the week’s turnover value, contributing LKR 0.26Bn or 19.29% of total turnover value. Lion Brewery followed suit, accounting for 17.56% of turnover (value of LKR 0.24Bn) while HNB contributed LKR 0.13Bn to account for 9.79% of the week’s turnover. Total turnover value amounted to LKR 1.35Bn (cf. last week’s value of LKR 2.73Bn), while daily average turnover value amounted to LKR 0.27Bn (-50.65% W-o-W) compared to last week’s average of LKR 0.55Bn. Market capitalization meanwhile, increased by 0.62% W-o-W (or LKR 17.63Bn) to LKR 2,866.15Bn cf. LKR 2,848.52Bn last week. 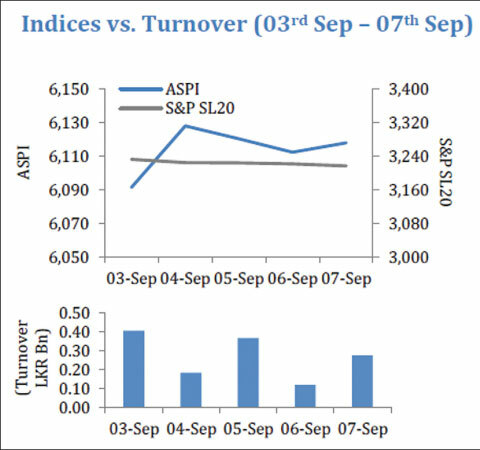 The Banks, Finance & Insurance sector was the highest contributor to the week’s total turnover value, accounting for 31.37% (or LKR 0.42Bn) of market turnover. Sector turnover was driven primarily by HNB, Union Assurance, Commercial Bank, Sampath Bank & Central Finance which accounted for 73.39% of the sector’s total turnover. The Beverage,Food & Tobacco sector meanwhile accounted for 23.49% (or LKR 0.32Bn) of the total turnover value, with turnover driven primarily by Lion Brewery which accounted for 74.75% of the sector turnover. The Diversified sector was also amongst the top sectorial contributors, contributing 21.36% (or LKR 0.29Bn) to the market driven by JKH which accounted for 90.34% of the sector turnover. The Banks, Finance & Insurance sector dominated the market in terms of share volume, accounting for 31.11% (or 17.33Bn shares) of total volume, with a value contribution of LKR 0.42Bn. The Plantations sector followed suit, adding 12.50% to total turnover volume as 6.96Mn shares were exchanged. The sector’s volume accounted for LKR 0.05Bn of total market turnover value. The Diversified sector meanwhile, contributed 6.95Mn shares (or 12.47%), amounting to LKR 0.29Bn. AIA Insurance was the week’s highest price gainer; increasing 80.5% W-o-W from LKR948.20 to LKR525.20 while Kelsey Development (+38.0% W-o-W), People’s Merchant (+21.2% W-o-W) and Tess Agro (+20.0% W-o-W) were also amongst the top gainers. Adam Investment was the week’s highest price loser; declining 50.0% W-o-W to close at LKR0.10 while SMB Leasing [NV] (-33.3% W-o-W), Serendib Hotels [NV] (-21.1% W-o-W) and Adam Capital (-20.0% W-o-W) were also amongst the top losers over the week. Foreign investors closed the week in a net selling position with total net outflow amounting to LKR 0.06Bn relative to last week’s total net outflow of LKR 0.77Bn (+91.70% W-o-W). Total foreign purchases increased by 7.47% W-o-W to LKR 0.65Bn from last week’s value of LKR 0.60Bn, while total foreign sales amounted to LKR 0.71Bn relative to LKR 1.37Bn recorded last week (-48.19% W-o-W). In terms of volume, Tokyo Cement & Richard Pieris led foreign purchases while Dialog & Distilleries led foreign sales. In terms of value, HNB & Lion Brewery led foreign purchases while JKH & Dialog led foreign sales. Sri Lankan equities continued the positive momentum created last week as the benchmark index gained 38 points or 0.62% during the week. The news of the potential return of the EPF to equities boosted sentiments last week and early this week. However, protests against the government by joint opposition created some political tension and the market also reacted with a 8 point loss on both Wednesday and Thursday. Despite this, the Broad Market Index regained 108 points, recovering from its 17-month low of 6010.23 points last Tuesday. Consequently, YTD loss on ASPI reduced to 4.6% cf. 5.2% loss till last week. Despite the recovery in the Index, Activity levels remained dull throughout the week and the maximum daily turnover of Rs.0.4Bn (recorded on Monday) for the week was also lower than the YTD daily average turnover of Rs.0.8Bn. Following the protest, on Thursday daily turnover hit a 5-month low of Rs.0.1Bn since April this year. Local HNI and Institutional investors remained inactive during the week as crossing for the week accounted for only 30% of weekly turnover (cf. 42% last week and YTD average of 40%). Lion Brewery dominated the bulk parcel purchases with 53% of the total crossing while HNB accounted for 22%. The foreign equity sell-off on the Colombo bourse meanwhile eased as foreign investors recorded a net foreign outflow of Rs.64Mn during the week cf. Rs.771Mn outflow last week. Markets in the week ahead are likely look for cues from economic and political development. In its latest Sovereign Credit overview for the APAC region, Fitch Ratings noted that although Sri Lanka’s policy framework has improved and supports both macroeconomic stability and rising government revenues, high government debt and a challenging external debt servicing outlook remain risks to the sovereign. Fitch noted that although Sri Lanka’s projected debt service payments are significant at $15Bn in 2019-2022, its foreign-exchange reserves as at Jun’18 was just $9.3Bn highlighting the country’s vulnerability to external financing pressures particularly in the context of rising US rates. Fitch estimates that GDP in 2018 will grow to just 3.8% before improving to 4.5% percent in 2019 while Government debt as a % of GDP should fall to 75.9% in 2019 (cf. 77.6% currently). The Agency noted however, that progress has been made on critical fiscal reforms (including the approval of an automatic fuel price mechanism effective May 2018) while steps have also been taken to introduce an automatic electricity pricing mechanism and establish a committee to develop a detailed restructuring plan for Sri Lankan Airlines. However, it noted that ‘deteriorating policy coherence and credibility’ could compromise investor confidence or derail the IMF’s EFF program and thus lead to external funding stress. The Group added however, that 1) further improvement in external finances (through higher non-debt-creating inflows or a reduction in external sovereign refinancing risks from improved liability management) and ii) continued improvement in public finances on the back of a credible medium-term fiscal strategy remain positive sensitivities for the Sovereign.